Some countries lead the way when it comes to renewable energy, and Iceland is definitely one of them. The country already runs on 100% renewable energy, with the majority coming from geothermal sources and hydroelectric dams. Researchers there are also working on new ways to harness energy from the strong Icelandic winds that are a feature of the island. One of the problems is that standard tall wind turbines would quickly spin out of control in these fierce winds, making their current use impractical. The average wind speed on Iceland is 40 miles per hour, with wind speeds of up to 112 miles per hour not uncommon on stormy winter days. 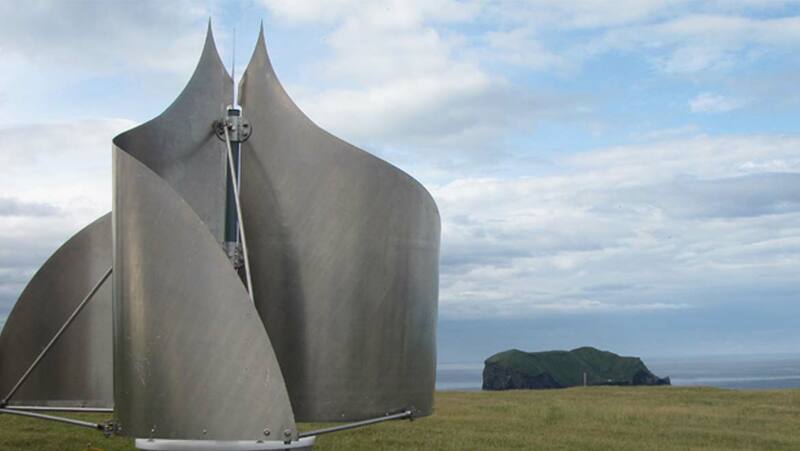 Icelandic inventor Saethor Asgeirsson realized that the solution to this problem was not to avoid wind energy altogether, but to create a totally different type of wind turbine. He created an innovative design which centers on a turbine that is short and wide, rather than tall and thin. He was been working on this design since 2008, but in 2012 founded his company, IceWind. IceWind turbines have vertical, curved blades which sit on a wide base. The innovative blade design controls the speed of the spinning turbine no matter how fast the wind may be blowing. Another advantage is that the turbine can generate energy from wind coming from any direction, due to its curved design. IceWind currently has two product lines in development, the RW turbine which is specifically designed for generating power for surveillance spots and telecoms towers, and the CW1000 which is designed for residential use, on or off-grid. Whilst Iceland is already capable of producing all energy from renewable sources, individual homeowners who live off-grid, or have a rural holiday cabin as is popular in Iceland, are still interested in efficient wind turbine systems to power or heat their homes. The turbine takes inspiration from an ancient Persian design, updated with modern materials. Each turbine is hand crafted in Iceland from stainless steel, carbon fiber and aircraft grade aluminum. The turbines have a very wide range of energy production, ranging from extremely low winds of less than 5 miles per hour, to very high winds of over 110 miles per hour. In high winds, the turbine will automatically slow down to prevent the machine catching on fire, or the blades being damaged. Another big advantage of these turbines is that they have no impact on bird life because they are either mounted low to the ground or on existing telecoms infrastructure. Residents near windfarms often complain about the noise, but IceWind turbines are nearly silent so do not have the same level of noise pollution. It’s estimated that the turbines will last for over 30 years, and require virtually no maintenance during that time. IceWind’s turbines are currently in a testing phase but should be available soon, and the company hopes to export them to rural areas worldwide.